Firefly is a community of some of the most creative people from New England and beyond. The making and sharing of art is one of the central pillars of our collective vision. To this end, we come together in the woods once a year to be inspired by the environment, each other and our creations. All levels of creativity are welcome at Firefly; from your first attempt at artistic expression to gallery quality works. If you are just beginning to explore your creativity, Firefly is an ideal environment in which to experiment. Experienced artists and their work are welcome as well, and the entire creative range in between. Here the strange and unusual is welcome. Your art does not have to be approved by a curator, or be financially successful in order to be valuable or impress anyone. Here you will find a home and an open-minded audience for whatever your creative impulses bring forth. Creating art for Firefly is one of the most personal and rewarding ways to participate and contribute to the richness of the entire community’s experience. Below is a list of registered art pieces that came to Firefly last year. Anyone can bring their art – to learn more, scroll down to Bringing Art to Firefly. We will post this year’s art and placement info closer to the event. You don’t need permission to bring your art to Firefly, but, if you’re planning something, we’d love to hear from you, especially if you are thinking of a large installation. If you want to assure a spot for your art at the event and be on the event map, go to the Placement Form before the deadline and fill it out. You can also get more time to set up your art–and drive it up the hill–if you’ve filled out the Early Arrival Application. If you want your art to be listed on our website and in the What/Where/When guide for the event, be sure to fill out a What/Where/When Form before the deadline so we can add your project to the Art listings. If you have any questions, contact the Art and Theme Camp Placement team. Firefly creates a unique relationship between the natural and the artificial. Some of our favorite memories are of works of art placed in special natural environments where they suddenly seem to belong. In past years, Firefly explorers have come across a rose garden in the woods, a glowing galaxy in the meadow, disco balls hung from trees, and a winged, mossy frog sitting above a brook. We would love to see more sculpture and installation art, and we have plenty of space for it. DJs, bands, and performers of all types are essential to Firefly. The festival is full of opportunities for jamming and improvised performance. Scheduled performances with amplified sound are also possible when a performer collaborates with a camp that is able to provide a sound system. If you are a performer, you can turn your camp into your ideal venue, or use the Fireflyblink discussion list to find another camp to host you. If you need help connecting with a camp, get onto the Fireflyblink list and collaborate with other musicians and camps so you are heard! This ain’t no ordinary gig — be prepared for adventure! Fireflies love fire performance and all types of fire art. There is nothing quite so exciting as having the darkness ripped out of your night with an unexpected WHOOSH of fire from nearby. There are areas designated specifically for fire art and we pay strict attention to safety and the use of proper equipment. ALL fire sculptures and fire art MUST go through our fire art review and approval process. 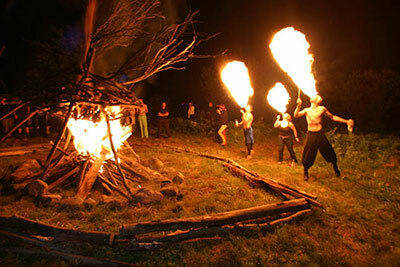 We’ve listed all our fire policies here, for camping, performance, and art installations- please read! Then, for more information you can always email fire (at) fireflyartscollective (dot) org. For many insects, dancing is an important form of communication. For many humans, it is a reason to exist. There are many venues for you to expressively dance your ever-lovin’ socks off. However, if you want to do some more formal dance performance, use the discussion lists to find a camp to host you. Come out into the woods and dance with us. VJ art and video screenings are also an important part of Firefly. In the past there have been theme camps focused on this art form. If you have something to show and do not have the equipment, some theme camps may provide projectors and screens. Use the discussion lists to find a camp that fits your needs. Of course Fireflies’ favorite activity of all is glowing. At night our village lights up with lasers, LEDs, EL wire, glow sticks, and black light painting. Glowing art can take on so many amazing forms – see what you can come up with, it is always welcome. This is your opportunity to dress how you feel, or become a character from your own mythology, or try on a whole new you. Some of the more unusual experiences and intense creativity encountered have been exemplified by the costumes, and their owners, we have come across on the trail. Art does not have to be relegated to the woods, fields or paths; your camp can be your art. Everybody needs a home at Firefly so why not make that home an art-filled one, or a piece of art itself. For more info see the Theme Camps page. Firefly is a gift economy—you may want to make something special to share. Hand-made art gifts are awesome, but gifts of food and drink are always appreciated too. If you make art that does not fit into any of the categories on this page, we’d especially like to experience it. Your creativity can turn a clearing in the woods into a perfect place for meditation, ritual, dancing, performance, chilling, teaching, meeting or partying. If you want to assure a spot for your art at the event, look for the official announcement from the Placement Core before the event. You can also wait until the start of the event to place your art, but by then there are fewer options. If a space hasn’t been taped off for a camp or another piece of art and as long as you show respect for your neighbors and public spaces, your project can go wherever you choose (unless it involves fire, see Fire heading above). Electricity is not supplied by the event, but may be available in limited areas by camps with generators. If your project requires power it’s usually best to provide your own or connect with a camp that you can share resources with on the Firefly-blink mailing list. Often Nature puts Firefly to the test with rain, wind, mud, and cold. Don’t let this scare you, but be prepared for an adventure. If your site does not happen to be near the main road, you may need to move your gear quite a ways on foot. Have you thought about how your art is going to be placed? Does it need to be hung from something? Does it need to be staked down or guyed in some way? Are critical components weather-proofed? Will hippies accidentally dis-member it? If you’re new to Firefly and you’re planning something big, use the discussion lists to network with experienced Firefly artists and learn what to expect. Remember, Firefly is a Leave No Trace event. This means your project should be planned to have minimal impact on the land, and you will be expected to remove it entirely at the end of the event AND make sure that the area immediately around your piece has been left as clean, or cleaner, than when you found it. Anything is possible at Firefly, especially when you take into account collaboration between participants. If you have an idea but need volunteers, advice, or resources to make it happen, posting to the Firefly Blink List or the Facebook Group is the best way to find them. Firefly is proud to offer grants for creative projects. For more information, see the Art Grants page. Don’t forget, all Firefly participants – including artists, performers, and organizers – need tickets. The latest information on ticketing and ticket availability can be found on the Tickets page of this site.